When a rail line finally closes, it is an undeniably sad event. Railroads are an integral part of the American ethos, and without them, the Manifest Destiny doctrine would have been much more difficult, if not impossible. Railroads connected the two oceans, and are just as important to our economy now as they were in the 19th century. CGW/CNW Bridge over the Little Maquoketa River in Durango, IA, part of the Heritage Trail. However, as sad as it is to see a line go from hauling freight or passengers to a derelict state and finally close, it is ultimately necessary in some cases. If the revenue of moving goods along the line cannot justify the costs associated with running the line, the railroad is at a disadvantage to keep running it. With that in mind, as railroads have become more efficient operators, and as roads, highways and the trucking industry have opened up vast swaths of lands, there are some railroad lines which are now functionally obsolete. In fact, there are many such lines in the United States and Canada, along with the rest of the world. 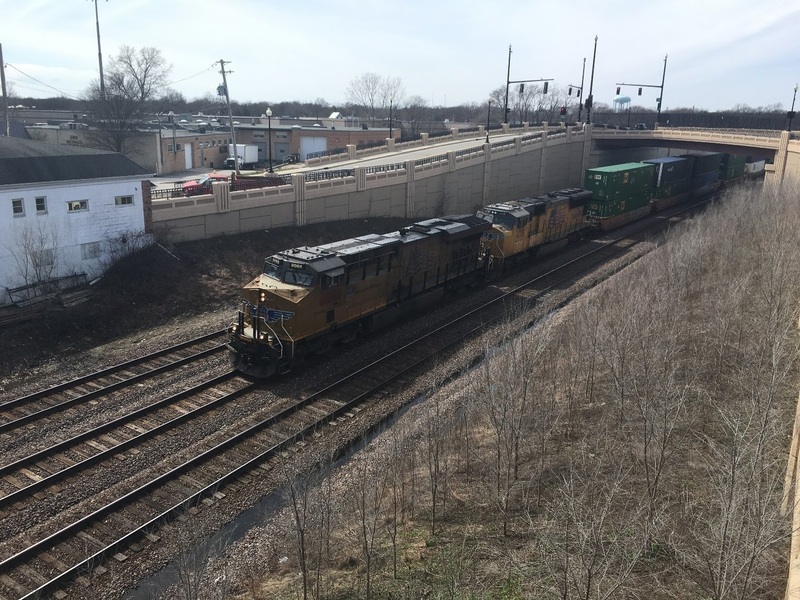 A great question in transportation planning is what to do with these parcels of land, many of which are excellent for trail development, as railroad rights-of-way are generally long, flat parcels perfect for walking and biking. Nonetheless, there are some people, railfans, people who own land near defunct lines, and others, who disagree with creating trails from abandoned lines. Along the Henslow Trail south of Elwood, IL, along the abandoned Joliet Munitions Plant Railroad Tracks. Yet, given the benefits of trails, which are that railroads receive with regard to lower taxes, regulatory and maintenance costs, the benefits to communities who can build around a trail, as opposed to dealing with urban blight, and the benefits rail fans, who have the opportunity to experience some of the most unique views and travel along historic railroad routes this country has to offer, I believe that rail trails are an excellent investment for all stakeholders. I should note right off the bat I have no sacred cows; I’m not a member or involved in any way with any trail planning organizations, nor have I ever operated a train. My only stake in the argument is that I personally like walking along rail trails. During the late 1960’s and 1970’s, Federal regulations were literally killing the railroad industry. A number of Class I railroads went bankrupt, most notably the failed merger of the Penn Central, which had a very negative effect on northeast commerce. Railroad lines with saw no profit were nonetheless extremely hard to abandon. For the Penn Central, which was a conglomerate of the New York Central, Pennsylvania Railroad, and the New York New Haven & Hartford, these railroads before their merger had many routes that competed with their one-time competitors. The large amount of overhead significantly affected efficiency, and maintenance costs were deferred. Adding insult to injury, these lines were also subject to property taxes. This deference also led to safety issues, and ultimately forced Congress’ hand in saving Northeastern rail by creating the government owned Conrail to assume the unprofitable lines of the Penn Central and other northeastern railroads. While this is an intentionally simple view of a much more complex issue, as the government ushered in more deregulation, it allowed Conrail and other operators to begin abandoning more lines. Conrail went from losing billions in the late 70’s and early 80’s to posting small profits and eventually making significant profits, which allowed it to be sold off in 1999. While it seems counter-intuitive, one must realize there is much more to the railroad industry than rails and rights-of-way. As time has gone on, advances in technology, such as PTC and train management systems, have made the railroad a safer and more efficient operation. More can be done with less, as the above graph illustrates. Abandoned or disused right of way creates both blight and hazards. Which area would you rather live nearby, this? Abandoned rights-of-way can lower property vales and increase trespassing. In addition, the infrastructure can create hazards for those trespassing within it. Just as abandoning a line and letting it turn into blight can have a negative impact on the community, rebuilding the area into a trail or a linear park can have economic benefits. The High Line in New York City is an example of a successful project which has earned well over its initial investment in property tax increases and added tourism to the area. But this also is true in rural areas as well. between Joliet and Chicago Heights, IL, cutting through downtown Frankfort. 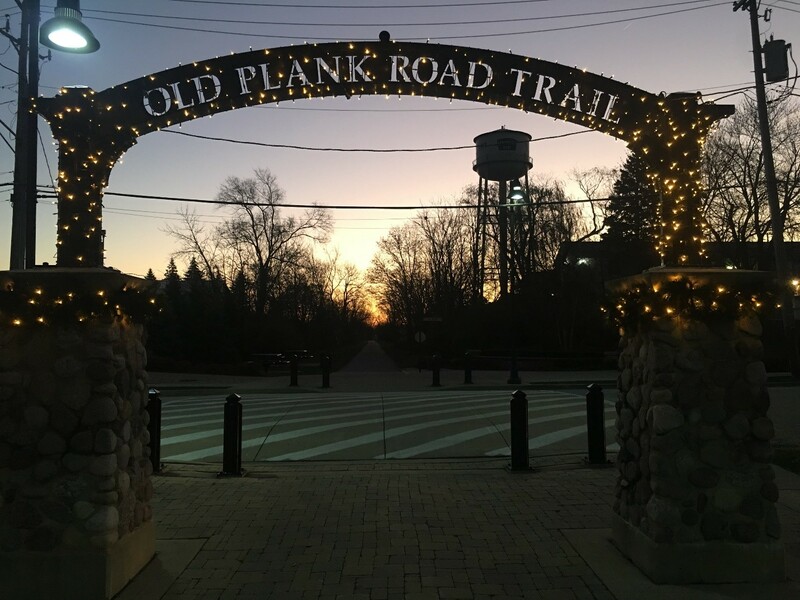 The area is home to many different shops, restaurants, parking, restroom facilities, all of which are much more accessible thanks to the trail. Frankfort even uses the Old Trolley Barn from the interurban line as more shops, both preserving history and finding a modern use for it. From the perspective of the rail fan, there are many who believe that the history of the line must be preserved. I wholeheartedly agree. Luckily, most if not all trails I’ve been on acknowledge their history as a rail corridor both in print and on the trail. While the trains may no longer run anymore, the trails are certainly aware of their heritage, informing the public for generations about the railroad lines of years’ past, and their impact to the community. But in my opinion, what makes the rail trail especially great for railfans though is that many are built near existing railroad lines, making it possible, legal, and safe to get some excellent views of operating railroads. Before the addition of the Prairie Path, there was no way to get this view from Wheaton, IL. Indeed, some of the most scenic and hard to reach places are found not by paved road by railroads. Out west, the Milwaukee Road Pacific Extension abandoned over 500 miles of track, many of which is now various trails today, and use the original bridges and trestles of the former line. The same is true of the Kettle Valley Railway in southern British Columbia, which has a trestle tour along its now rail-trail. At the end of the day, one must look holistically at why railroad lines are abandoned in the first place, railroads are businesses, competing with one another. Not every business is going to be successful. And when it negatively affects the economy and livelihood of the area around it, not every business should be. Looking at the industry, railroad abandonment does not hurt the industry in the slightest. In fact, it’s actually a very successful tool and lowering overhead costs and allowing the lines with the most significant and profitable traffic to run more efficiently. Another item to note is that, thanks to the National Trails Systems Act, is that railroad lines which don’t have any traffic on them can be “rail-banked”, which allows the corridor to remain intact for a future railroad if a need for traffic ever comes back. There are many railbanked lines across the US, and trails are allowed to be built on them in the interim. This is another big win for railroads, as railroads do not have to worry about a line being lost forever if the line becomes abandoned, as if it were abandoned, in many cases the land would either be sold or reversed back to the original owner of the line, creating significant legal and real-estate obstacles were a need for a railroad ever arose in the future. And there have been examples of lines being rebuilt, in whole or in part, which would have otherwise been lost for good. Trails also help communities with tourism and accessibility, which is excellent in an age when non-motorized traffic is increasing significantly, and people’s health, quality-of-life, and impact to the environment are as important as ever. Lastly, even railfans benefit by rail-trails, even if the loss of traffic is unfortunate, but there are more than enough miles of the railroad industry left to enjoy, and there will be for many generations yet to come. Just stumbled on your blog...very nice, and sorry I didn't spot it sooner. Back to the point, the problem is the "rails to trails" movement has taken on a different dimension, where existing tourist or local short line railroads are being threatened and uprooted by more activist trail groups. The Adirondack Scenic, Catskill Mountain, and Saratoga North Creek railroads are all under attack in upstate NY, as are the Cape Cod branch short lines near Falmouth MA, by strongly active local & vocal trail groups. There are examples of the same in other US locations. In a lot of cases, these groups go to great lengths to bemoan the hazards & so-called adverse environmental impacts of existing railroads, and falsely promote the benefits of trail conversion, particular greatly understating the conversion costs. Its NIMBY-ism to the extreme. And there are locals that want nothing more than the right of way to simply just go away -- no trains, no trails, nothing. There are parts of the Cape Cod Rail Trail that were former Penn Central/New Haven right-of-ways that simply end the trail, due to property owners that did not want a trail in their backyard. While its definitely good to see long abandoned lines get a new life as a trail, this movement to kill off existing tourist & short lines is very disturbing. That being said, I think there is a lot of misplaced animosity toward the movement as a whole from rail industry enthusiasts. Certainly the examples you mentioned don't help things one bit. Looking holistically though, the rails to trails movement isn't hurting the rail industry at all. I think that some see an abandoned railroad as a symbol of decay, and while there are examples where that's certainly the case, in many cases, the railroad system is simply consolidating resources to maximize efficiency, no different than any other industry. The rail trails movement, at it's best, is recycling the excess for public benefit. But that isn't to say that the movement is 100% perfect, either.